The Pentacam® is a combined device consisting of a slit illumination system and a Scheimpflug camera, which rotate together around the eye. A thin layer within the eye is illuminated through the slit. Because they are not entirely transparent, the cells scatter the slit’s light. In doing so they create a sectional image which is then photographed in a side view by a camera. This camera is oriented according to the Scheimpflug principle, thus creating an image of the illuminated plane which appears absolutely sharp from the anterior surface of the cornea right up to the posterior surface of the crystalline lens (if the pupil is dilated wide enough). 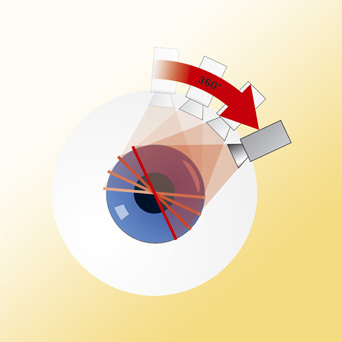 Rotating around the eye, the slit-camera device generates a series of radially oriented images of the anterior eye segment. In the subsequent analysis of the sectional images, tissue boundaries are detected and point clouds are assigned to the various tissue layers (anterior and posterior corneal surfaces, iris, crystalline lens). The Pentacam® is one of the instruments on the market able to perform a precise and complete measurement and analysis of the centre of the cornea. The rotating measurement principle assures a large coverage of the corneal surface and a minimization of the nose shadow. Due to the radial orientation of the sectional images the density of data points is greatest at the center. This contact-free, hygienic measurement process takes less than two seconds. This is the time it takes to generate 50 sectional images yielding in turn 138,000 distinct elevation values (Pentacam® HR). A highly efficient, well-organized practice allows more time for your customers. OCULUS customer data administration is a standard feature of the Pentacam®. Perhaps you’d like to work with your own practice software? No problem. The Pentacam® can be integrated into your software system quickly and easily. By networking your equipment you can easily back up and synchronize all examination data, optimize work processes, and thus save time and cut costs. 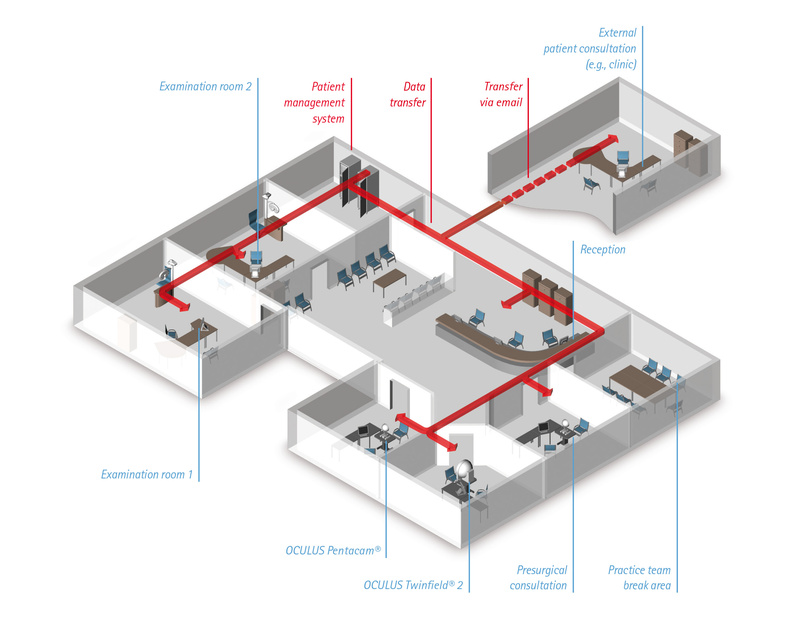 In order to be able to read and process data gathered by the Pentacam® at your workplace without the device, you must have a software license for this workplace. The Pentacam® software is included in every software licence and is freely configurable. Your licence is not tied to one particular instrument, i.e. you can use it to read data from examinations conducted with other Pentacams®.